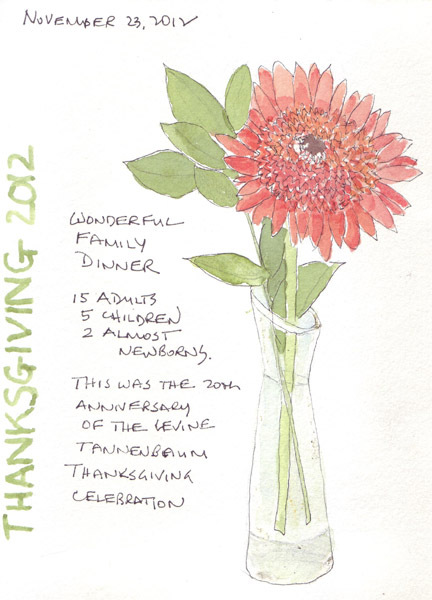 We had a big family Thanksgiving at our apartment on Thursday and I painted the Gerbera daisies I had in the bud vases on all of the tables. The following day my husband and I relaxed and then I started planning the Christmas ornaments I will make for our grandchildren. I made one prototype in order to work out problems with the pattern. But then I needed to make a second one to tweak things more. Now I'm almost done making a total of 15 Santas - assembly line production. 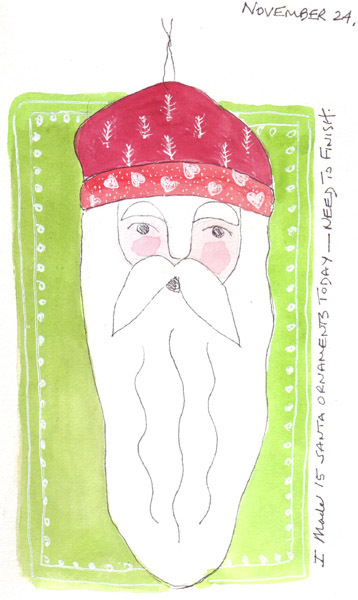 The Santa head is the ornament - measuring about 6" long. The green square is artistic license on the page! Our Journal Study Group met at my apartment a week ago and made wonderful little Origami Tag Books. The method was published by Lenna Andrews Foster in Artitude zine (issue 14 - maybe available on Etsy). 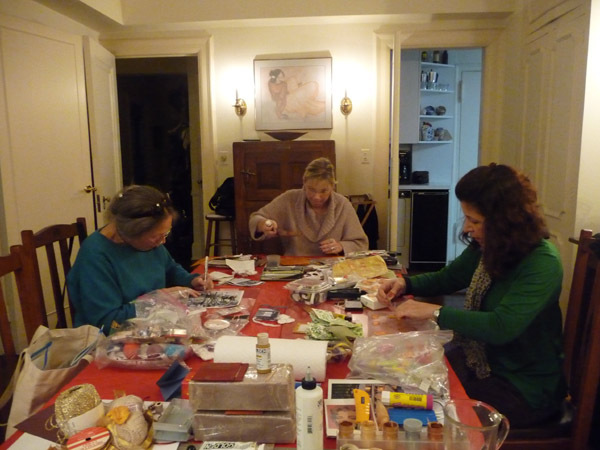 From left to right: the busy artists are Pat, Teri, and Benedicte. Pat made one of these books several years ago and offered to teach us the method. She made a new one while teaching us, so we were all very busy talking, laughing, cutting, folding, gluing, stamping, and writing. I needed to make 3 tags per page for a total of 21. 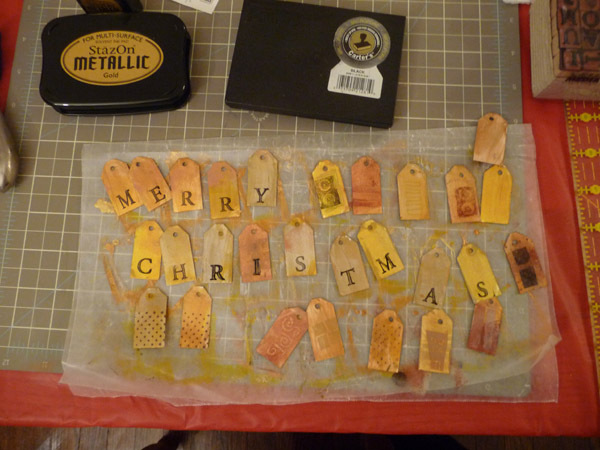 These were cut from card stock, painted with a variety of metallic paints, and then stamped. 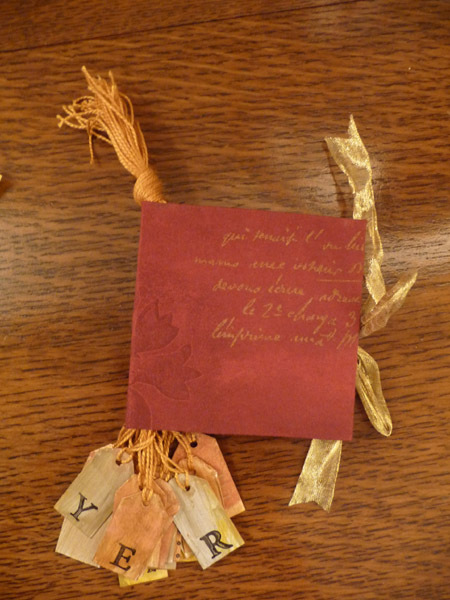 Here is a photo of my completed book - which measures 3.25 by 3.25 inches. These are the origami folded pages - which I stamped with my handmade fun foam stamps and gold metallic ink. Along the edges I wrote the words from the beginning of "T'was the Night Before Christmas." Each of us gathered materials from our stash, as our goals for the day were to learn the process. 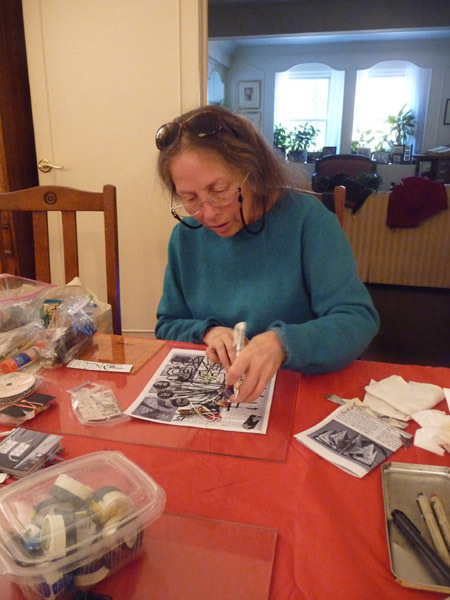 Pat used her old monotypes. Teri added collages to each page. Benedicte stamped over every square inch of her pages using a lovely leaf stamp. At this angle you can see my stamps and just a little of my gold pen writing. 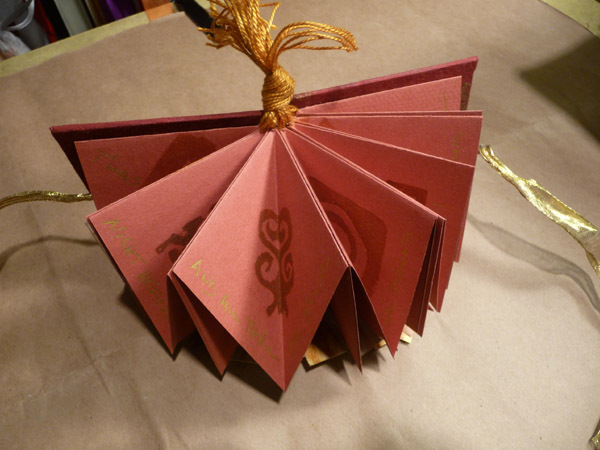 The book can be opened completely and tied in a star shape. 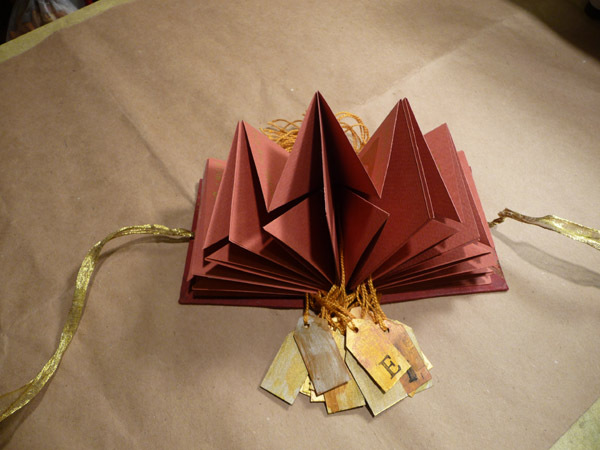 A smaller book, with fewer tags, would make a lovely Christmas tree ornament. 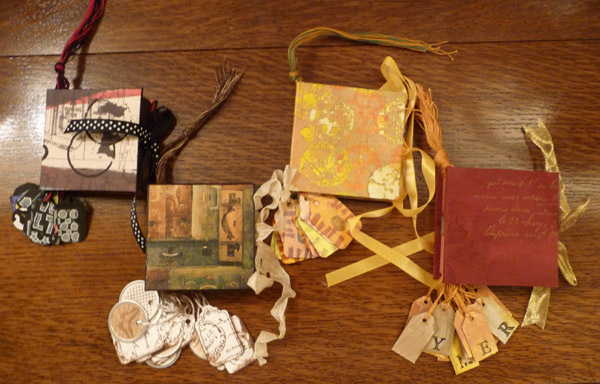 Here are the 4 finished books. From left to right: Pat's, Teri's, Benedicte's, and mine. I would love to figure out how to add watercolor paintings to the pages, but I need to experiment with different weight watercolor paper. We took a free 3 hour walking tour of Pest the day we arrived and were immediately able to feel the ambience of the city. They still need to do some rebuilding and we saw at least one large apartment complex, several blocks from the Opera House, that still has bullet holes across the facade. 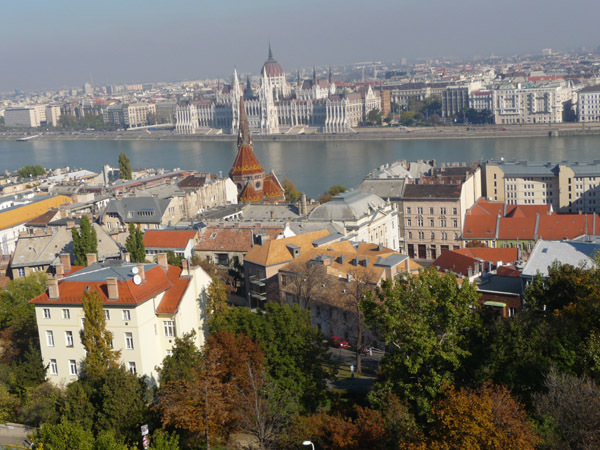 The important sites in Pest are along the Danube. Buda looks beautiful on the other side, the Castle District sitting high above the river. 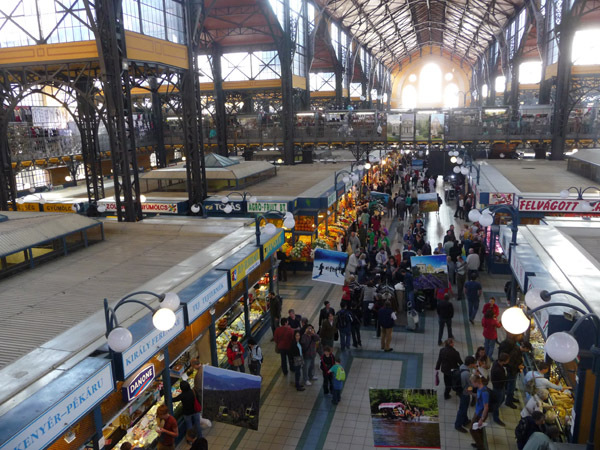 I love huge indoor city markets and this is a photo of the lower food floor from the upper artisans' floor. 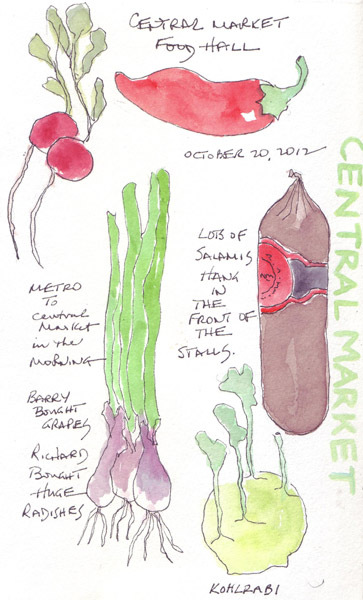 These sketches were done quickly as we walked around the food counters buying snacks. We took the tram across the Danube to one of the main streets of Buda - and it is lovely. 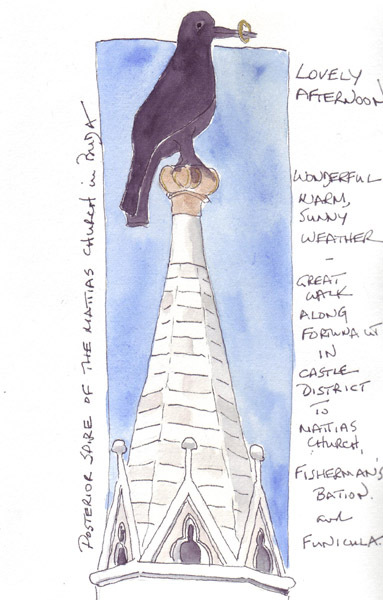 It was a gorgeous day, and while we sat next to Mattias Church eating ice cream, I sketched one of the posterior spires because of the black bird with a gold ring in its mouth. 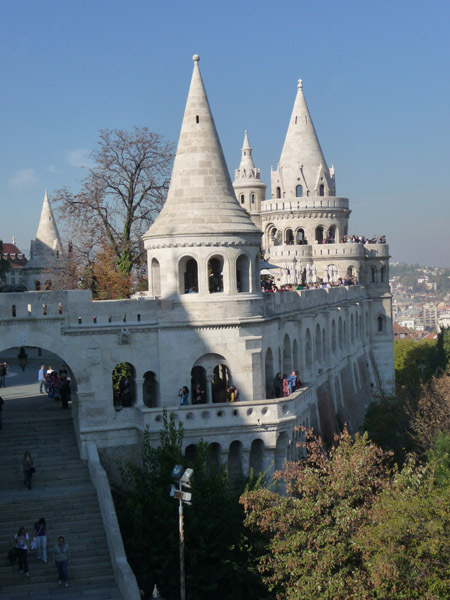 One of the best photos I took of the Fisherman's Bastion - which was built in 1902. 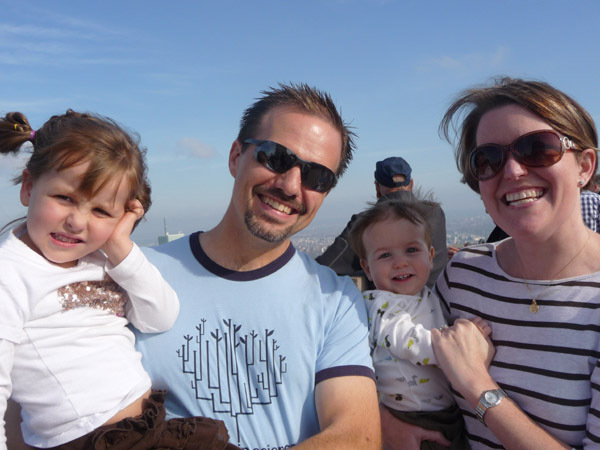 Our son Jason, his wife Shannon, Annabelle (4 yrs old) and William (10 months), visited us from Washington DC over the Veteran's Day holiday. 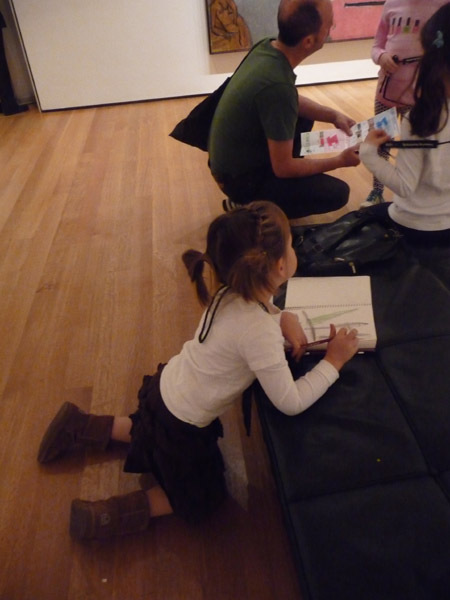 On Monday I invited Annabelle to the Museum of Modern Art (MoMA) to listen to the Children's audio guide on select paintings. 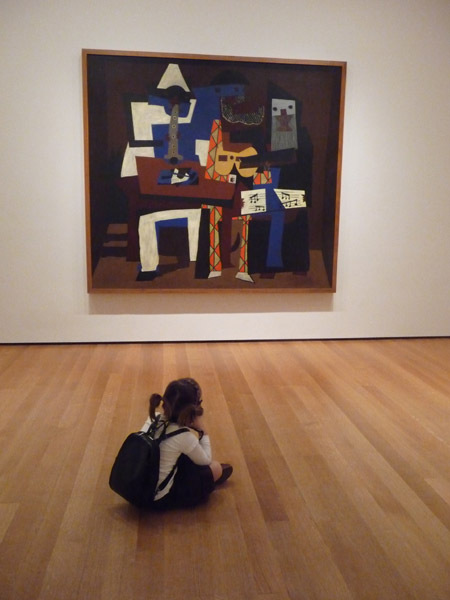 Here she is listening to wonderful information about Picasso's Three Musicians. She very quickly decided that she NEEDED to sketch, instead of listening to more commentary. I sketched with her and added paint at home. These are 3 detail images from Rousseau and Matisse. I had a great deal of difficulty getting her to leave the museum to meet her family and Grandpa for lunch, and then we all went to the Top of the Rock. NOTE: Scroll all the way to the right on this link and you'll feel like you are there! She had lots of questions about skyscrapers the day before and wanted to go "high" to see them. It was my first visit there and it is FABULOUS. Although you aren't quite as high as in the Empire State Building, there are 3 levels for viewing and high clear walls from bottom to top, so even the smallest children can see well. 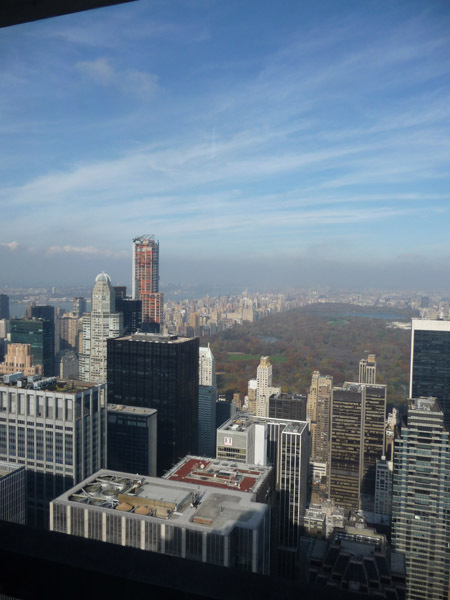 This is my photo looking north, over Central Park. 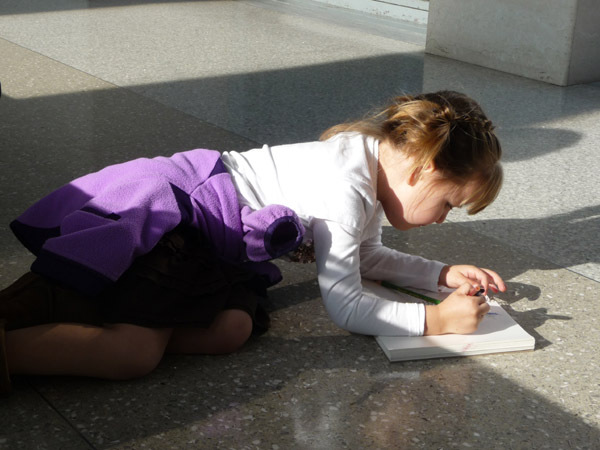 After we visited all 3 levels, and looked in all 4 directions - taking lots of photos - Annabelle wanted to continue sketching. 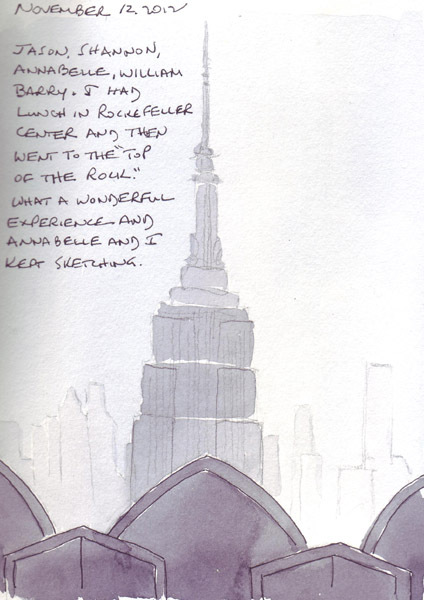 I did a quick sketch of the barrier at the bottom of the clear wall, the Empire State Building, and the skyscrapers in the Financial District looking south. I sat on a bench while sketching and therefore the decorative barrier right at the bottom of the clear barriers looks bigger and the amount of the building I could see looked smaller. I painted it at home. Prague is a beautiful city. 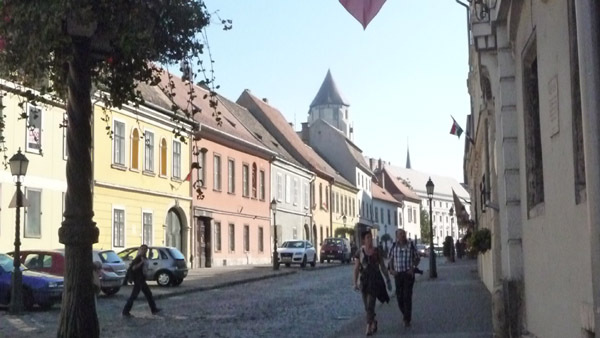 It was the least WWII damaged of the 4 cities that we visited on vacation and the block building style of the Soviet era is not visible when you are in the oldest parts of town. 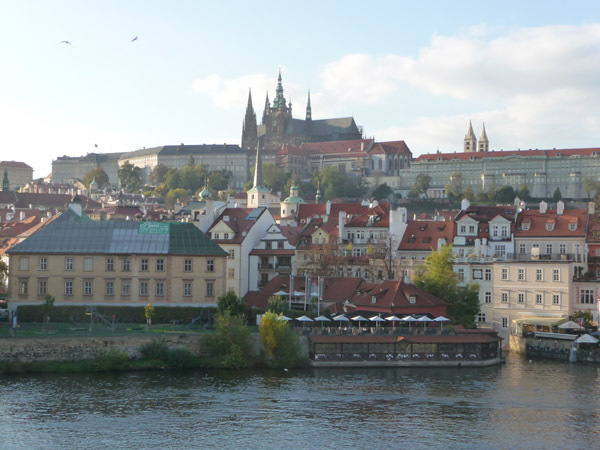 I took this photo from the old town side of the Vltava River - showing the Prague Castle area up on the hill. 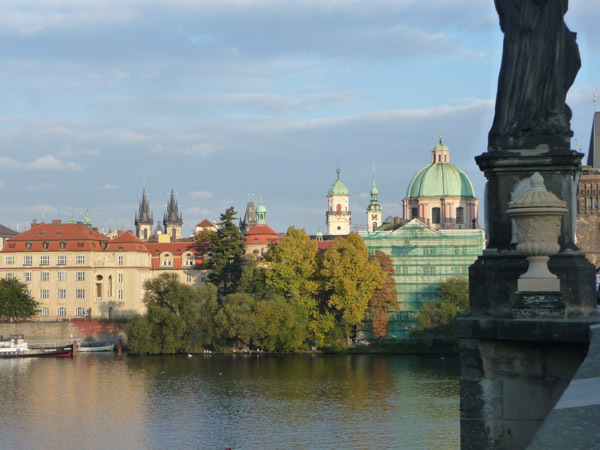 This photo was taken of the Old Town area from the very famous and beautiful Charles Bridge. 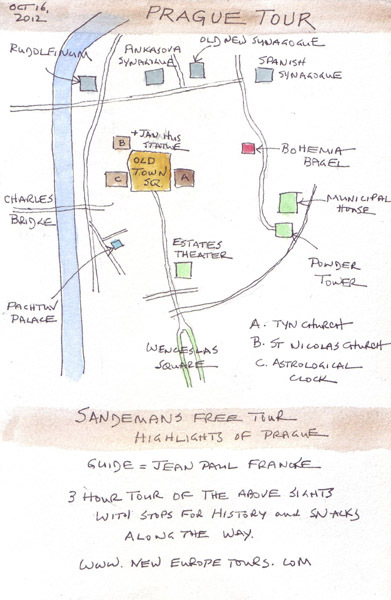 We started our visit with a free, 3 hour walking tour of the highlights of Old Town. 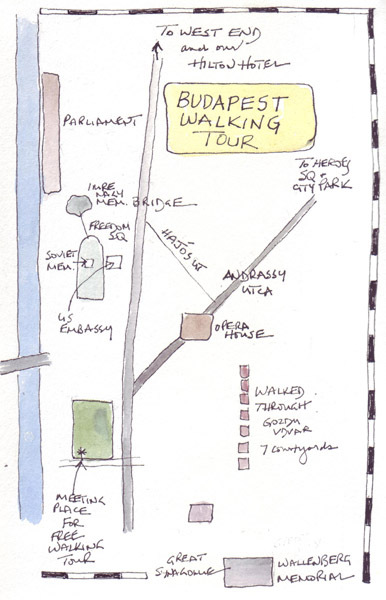 Tour companies offer these walking tours, and the group leader receives only tips. It was fabulous! We didn't sign up for any of their paid tours, but many people did before the free tour even ended. Seems like a great business model for New York City! 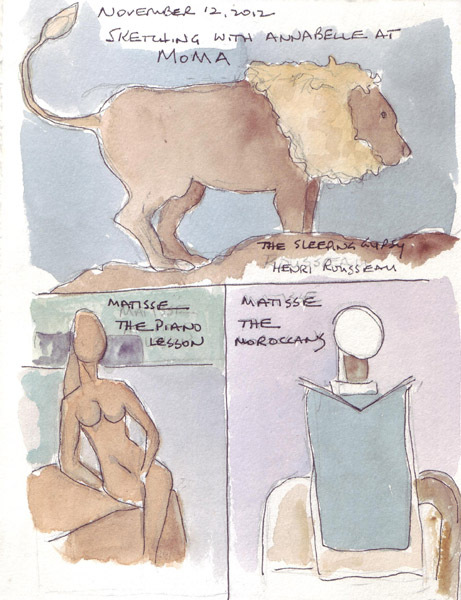 I enjoy reflecting on the tours, and here is my sketchbook page following that morning. The link for the tours is <http://www.neweuropetours.com>. I was in love with the City the minute that I walked into Old Town Square. But I'm only posting one architectural sketch that I did. 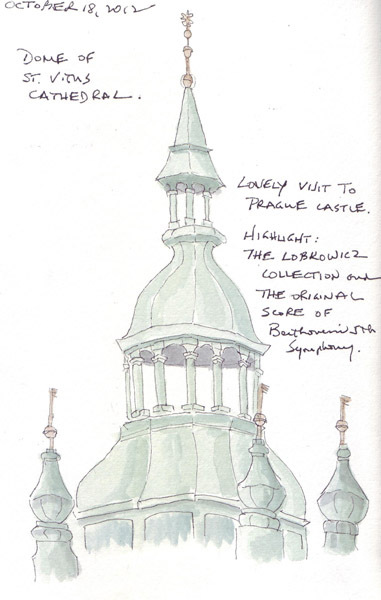 Here is the dome of St. Vitus Cathedral, in the middle of the Prague Castle District. On our final afternoon in Prague, we took a Walking Tour of Prague's Jewish Quarter http://www.Wittman-tours.com. This was the same company that took the 4 of in a van, with a private guide, to Lidice and Terezin (see earlier blog post). 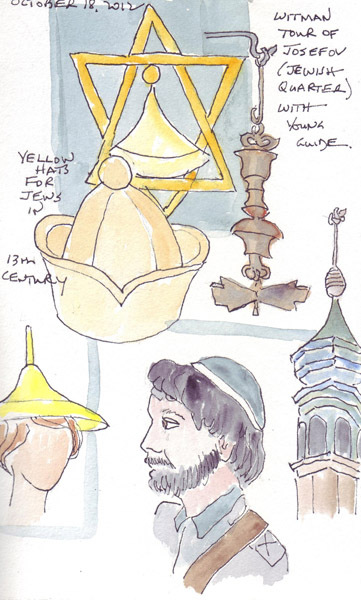 I walked and sketched on the Jewish Quarter tour, including many of the hats that Jews were required to wear over centuries, and a quick sketch of our tour leader.